We released a new Flow Control version today, v2.0.8. Select "Closed Loop Coolers" and select the remaining options. Click Submit and download the latest version of Flow Control. Has to be a software issue and im sure they will fix it. If not ill sell it and get something else i guess. But i do love my evga stuff so far. EVGA CLC Flow Control software disconnects from USB or shows "No USB Device Found"
EVGA flow is running in task manager (in 32 bit mode for some reason) but there is no sys tray icon or actual program running to use. I can't find any help on this issue and I want to play with my pump speed XD. Found that if I delete the profile.cfg file C:\Program files (x86)\EVGA\Profiles\ , the UI will come up BUT: I cant save any changes to the config (duh.. deleted cfg). Tried to mod the config directly (start minimized "0"), but can't save the .cfg file due to WIN10 permissions issues (WIN10 bug on fresh install). Can see pump face changing colors (Default profile .cfg setting Rainbow) so pump is working. Can also see CPUWB.exe running in task manager, just cant get UI to load/display AND then safe a profile. over a year later. The LED sync between evga graphics cards and the waterblock still don't work. What gives? My fans on my 280 clc are spinning at 2280 rpm cant get them to run at lower speed? I have flow control installed. I just got my CLC 280 and I have this exact same error. I've gone through various threads and tried recommended solutions such as set the fan header to full speed, tried uninstalled Precision XOC, reinstalled Flow Control. I don't even see the driver in device manager, yet I was prompted to install the driver. Running x64 Windows 10 Enterprise, is that not supported? Otherwise I am at a loss at why this isn't working. When will it be updated to work with first gen ryzen X series processors. My 1700x always reads 20c higher than it really is and messes with the fan profile. flow control and ryzen master showing the difference. I tried a clean install of windows with just flow control, it still had the issue. I'm thinking its software issue. I've decided to just get a corsair commander pro and run every fan off it. I too am having problems with the EVGA Flow Control app on my ASUS X99-Deluxe II motherboard. There appears to be a conflict between the EVGA app and the ASUS fan control software. When I run the ASUS FanXpert module to tune the fan, the EVGA app will crash with a ‘device not found’ error. I uninstalled the FanXpert module from the ASUS AI Suite software, and the EVGA Flow Control app started working again. I can live with this because monitoring and controlling the CPU fan and pump is more important than the chassis fans, which I can still control within the BIOS. Just build a fresh build. And getting the same result "Device not found" did all the steps taken, MAX fan in BIOS, checked all connections 2.0usb and cpu1 or 2 fan headers. Still not working :( Please help. I have the exact same issue with my 1800X on a MSI X370 GAMING M7 ACK mobo with the latest bios, the CPU temp showing in the EVGA Flow Control 2.0.8 is much higher (about 20 degree C) than Ryzen Master or HWMonitor (temp in those two matches). I also have the opposite issue in my second rig with the Ryzen 2700 on a Gigabyte X470 AORUS Gaming 7 WIFI mobo, where the CPU temp in Flow Control showing lower than actual temp (by about 10 degree C). The coolant temp seems fine with both. Both are CLC280 model. Any idea on how to fix this or should I RMA both coolers? This software is so messed up. I uninstalled the driver because fan speed was not being reported. When I uninstalled the driver I ticked the box that said "delete driver files." Assuming the installer would reinstall the driver files when I run it. I guess I was wrong and now the fans are stuck at 100% and the EVGA FlowControl software will not even start. What the heck. Is there any way I can fix this without having to do a fresh Windows install?!?!? This software is so (Removed). I uninstalled the driver because fan speed was not being reported. When I uninstalled the driver I ticked the box that said "delete driver files." Assuming the installer would reinstall the driver files when I run it. I guess I was wrong and now the fans are stuck at 100% and the EVGA FlowControl software will not even start. What the (Removed). Is there any way I can fix this without having to do a fresh Windows install?!?!? Wow! Them are some really hard words to be using on this Family Based Forum. 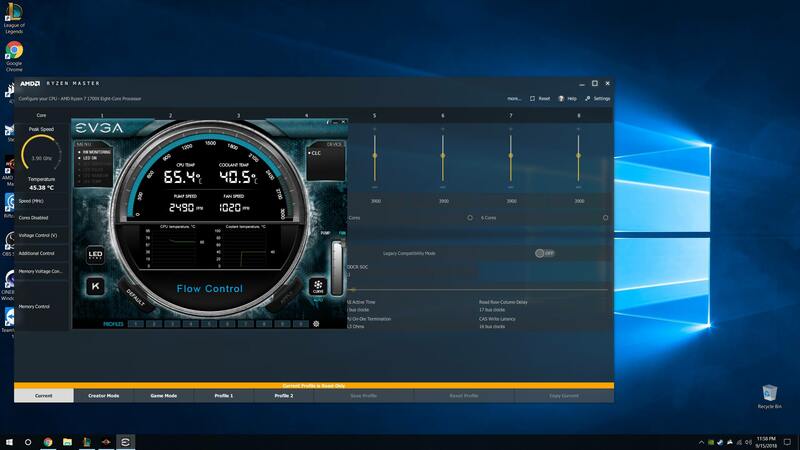 Don't think so and I still use EVGA Flow 2.0.8 snice released July which have ZERO error or any issue! My motherboard do have two pins are CPU1 and CPU2 so I have plug my CLC plug on to CPU2 there can adjust fan speed and CPU1 for pump that run full speed! I think you should try use on CPU 2. Darndest thing, I recently rma'd my x370 Taichi and with my 2700x the flow control worked fine on my old motherboard but it totally crashes windows 10 with my new motherboard. Keep getting different blue screens. Took me a while to figure out that was what was doing it. My 280 clc is on Z370 FTW connected to the CPU1 at full speed, USB connected to the port and it does not read cpu temperature?? Please help. Many times, but not successful. Have you try use pin CPU2 to test? I use my CPU2 cos I think that CPU1 is at full speed for cooler pump so try CPU2 for cooler fan adjust and make sure in your BIOS set FAN speed off Automatic! There is no problem with fan speed. Cpu temp can not be read. I too have issues getting the CPU Temp to show. - Set both the CPU_FAN & CPU_OPT to PWM (as well as DC, and a combination of DC / PWM between both). All 4 combinations; NO CPU TEMP. - Uninstalled, deleted files from Program Files (X86), deleted driver from Device Manager, reboot, reinstalled as Admin; NO CPU TEMP. Everything but the CPU temp won't show. LED works, Pump control works, Fan speed control works, Pump temp shows, and Fan speed shows. My motherboard is a Gigabyte Aorus Ultra Gaming Z370. Why can't I not see CPU temp and every other application that reads temps can see my CPU temp, yet, EVGA Flow Control can't?